Paper flowers can be handy at all times, you can use them for all kinds of table decorations and party adornments, have them as eye catcher on a special gift and make 3-dimensional greeting cards. Our crafty idea for colourful paper flowers is super quick and totally easy to make and with a blink of the eye your are swimming in a sea of paper flowers. 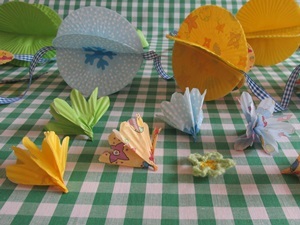 What you need to make these paper flowers: muffin liners and scissors. Use uni-coloured muffin cases or a bunch of colourful, polka-dotted, gingham or striped paper baking cups. With white muffin cases you can make pretty marguerites. With different single coloured and colourful muffin liners you will get a happy multi-coloured bunch of flowers. Smooth out and flatten the muffin liners, then fold into halves, fold again into quarters, fold again to eighths and finally fold again to the sixteenth part. 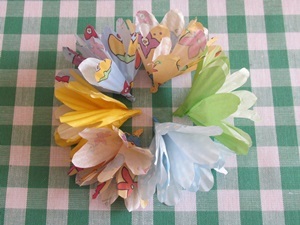 Now cut the outer corners to a round shape, like the petals of daisies (see picture). Unfold and – voilà you receive sweetly shaped paper flowers. Take the middle and form the flower, slightly twist at the tip, tear apart the petals. These paper flowers are super easy and quic to make. 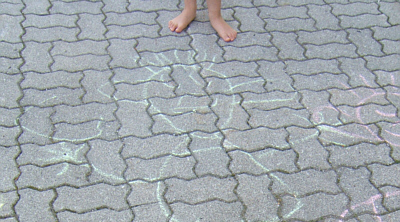 The perfect decoration craft to make with children. For single flowers use the coloured paper outside. When you are going to create a whole bouquet of flowers use the coloured paper of the muffin cases on the inside. 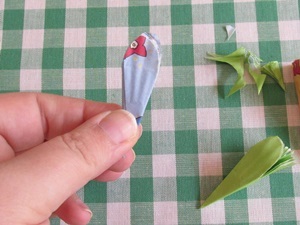 Attach the flowers at the tip to a wooden stick, e.g. with yarn or wire, or stick into a straw, arrange several flowers into a bunch. 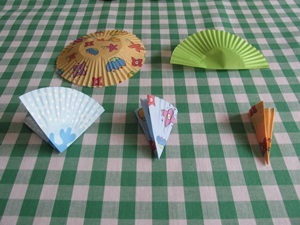 What do you think: Are you in the mood for more crafting inspirations with muffin liners? Then smooth some more muffin cases and fold only once hop to our DIY idea for a unique paper pompom garland made of muffin cases.